This section is dedicated to World War I Warships of all fleets, covering all the belligerents in 1914 and operations during the four years between the assassination of the Archduke of Austria in August 1914 to the Armistice in November 1918. Battles and naval actions, short biographies, illustrated by hundreds of illustrations, photos, detailed specifications, and often unseen maps. Although naval operations have been somewhat less extensive than during the next war, they have nevertheless been at the center of important and sometimes decisive events and raged from the Atlantic Ocean to the Pacific, the Indian Ocean, and the North Sea. In 1914, the largest naval power was undoubtedly the British pride, her majesty’s Royal Navy. Confirmed and maintained at the highest level by the will of Queen Victoria and her advisers, the Royal Navy grow from uncertain equality with the French and Spanish fleets to at unchallenged supremacy. In fact the whole XIXth Century’s “Pax britannica” started after the Napoleonic era, to endure until the first world war, almost one century year for year. This fleet was instrumental to gain or maintain a huge world colonial empire upon which the sun “never sets”. With the industrial revolution began the long “Victorian era”, the golden age of the British Empire. Through technological edge, numbers, and training, the Royal Navy was superior even to almost all combined fleets in the world, all possible alliances, as an invincible colossus. By inventing the concept of the dreadnought and the battle cruiser in 1905, she obliged other nations to line up in a costly, exhausting and unprecedented arm’s race. With “entente cordiale”, France, the former arch-enemy was turned to an uneasy ally. The bond was already created against a common enemy, Russia, by the Crimean War in the 1850s. In the twentieth century, this would be the ally of choice for Great Britain on the continent. Another former enemy turned ally, Russia, still had in 1905 the third fleet in the world, divided between the Baltic, Arctic and Black Sea. But the bleeding she suffered against the Japanese Navy deprived her of half its force, and fed a growing discontent that would have serious consequences in 1917… Japan in 1914 reached the peak of its development, showing the most powerful naval force in the Pacific. Repeated success against China and Russia gave the naval staff an almost blind confidence in their superiority, acute learners from an unsurpassed master, the English Navy. The home fleet, Spithead review 1914. The only power capable of blocking the British to reach out the Pacific, the United States, evolved in fifteen years from a small fleet, even inferior (on paper) to the Spanish Fleet, to a “Great White Fleet” second to none, following the precepts of the great American naval theorician, tactician Alfred T. Mahan. Under his influence the “hawks” well represented by T. Roosevelt tried to move away the opinion largely following the more isolationist current led by Wilson, until the Lusitania was sunk, combined with other aggravating factors. In the Mediterranean, Italy as a unified nation from the kingdoms of Sardinia, Piedmont, Savoy, was recent and the peninsula was still behind technologically. Nonetheless, it had in 1914 a powerful fleet and talented engineers, as Cuniberti, the man who inspired the English in their blowing the Dreadnought. But Italy was rivalry since independence, hard won in the Austro-Hungarian empire, heir to the Habsburg and now colossus with feet of clay to two-headed executive, continental power disparate peoples still maintained by a bloated administration. Its navy was reduced to the Adriatic because of its only access to the Illyrian coast as the harbor of Pola. Austro-Hungary ally and adversary of the past, heir to the Prussian empire, was under the firm grasps of the German Hohenzollern, a second Reich led by Wilhelm II (The first was forged by the great German unification architect, Bismarck). 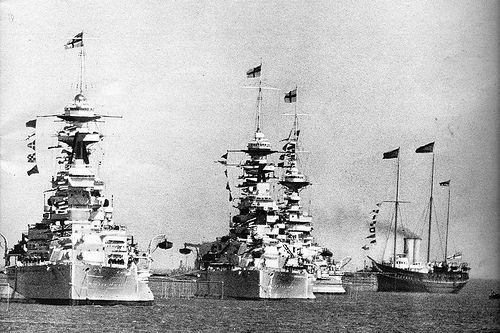 Claiming legitimacy towards the Holy Roman German Empire, Wilhelm’s family ties with Queen Victoria, perhaps a familial rivalry, perhaps child’s great naval reviews souvenirs, personal ambition and great designs for the Reich, had led him the will, if not the urge, to forge a similar fleet than the Royal Navy. This was achieved in the span of twenty years, as in 1914, the Hochseeflotte was ranked third in the world’s military tonnage. In the context of a declared rivalry in the North Sea, it was all the more formidable opponent for old Albion. 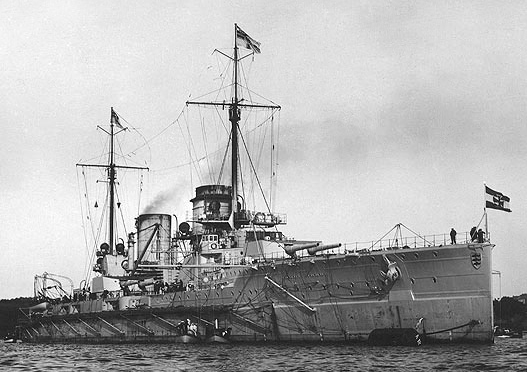 Seydlitz photo, a symbol of the Kaiser’s mighty fleet in 1914. The last member of this triple alliance was no less surprising: The old enemy of Christianity and “sick man of Europe”, Turkey. Opponent of Austria-Hungary since Charles V, the tired Ottoman Empire was reduced to its smallest component in Asia Minor, East and Southern Balkans, but now restricted to Turkey. Tts naval forces, far less impressive than in the 1860-70s, was firmly entrenched behind the Bosphorus strait. In 1914 this fragile balance was shattered. If most major clashes occurred between the Hochseeflotte and Royal Navy, the Italians were pitted against the Austro-Hungarians, allies against the Turks, Russians against the Turks and the Germans were the oppositions of this war. 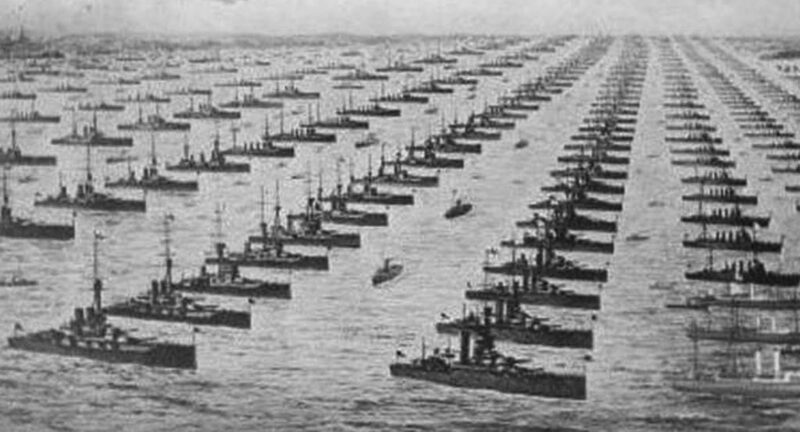 The overwhelming superiority of the allies compounded with the arrival of the American fleet in 1917, would maintain a relative naval inaction for Triple Alliance navies. However the Battle-cruiser concept was first bloodied and well-battle tested. Trading speed over protection it was at the forefront of most major engagements of the war, including a superb showdown at Jutland, and will inspire the fast battleship concept in the 1930s. The submarine also became a response to a massive blockade, attacking civilian ships of all sizes like great liners, as well as the first aircraft carrier operations, in 1918. In many ways, and to a much lesser extent, this war “invented” concepts that changed naval warfare for ever. The assassination of Archduke Franz Joseph of Austria, June 28, 1914 by Serbian Anarchist Gavrilo Prinzip . Historians are still dumbfounded before the unstoppable gear that brought the ruling houses and major powers of Europe at each other throats in August 1914. There is the strong will of Germany under Prussian rule, arrived in the naval race after the unification in 1870, and combining explosive factors such as a growing population, economical boom, an industrial powerhouse, and an ambitious militaristic regime which worried the two old western Democracies of the entente cordiale, France and the UK. France after the loss of Alsace-Lorraine following the defeat of 1870, had the will to take revenge and weary generations ready to take arms in 1914. The withdrawal of the Ottoman Empire from the Balkans and the independence of these countries will arouse the envy of neighboring states. This “powder keg” saw each small state trying to renegotiate borders, taking an even more ominous turn with the alliance of these to various major European powers. At the beginning of the century were therefore created the Triple Entente (France, UK and Russia) and the triple alliance of the “Central Powers” (Germany, Austria-Hungary, Italy). The spark is of course the assassination of Archduke Franz Ferdinand and his wife, Duchess of Hohenberg by an anarchist young Serb, Gavrilo Prinzip (photo) on June 28, 1914. Austria-Hungary investigation was refused by Serbia on grounds of National sovereignty. On July 28, after expiration of an ultimatum of 48 hours, the Austrian army opened fire and attacked. Serbia held it ground after initial defeats, confident to be supported by Russia, which on 30 June mobilized its troops and mass them on the border. On June, 31, The Kaiser asked “his cousin” the czar to abandon the Serbs and the French to not support the Russians. Following the refusal of both countries, the Reich declare mobilization (which was enthusiastically responded). In August 3, after invading Luxembourg and threatening Belgium, the Reich declared war on France. Following the invasion of neutral Belgium, The British Empire issued an ultimatum to Wilhelm II, which rejects it, and on August, 5 in the morning declared war on Germany. Japan will follow some time later. The masterfully executed Schlieffen Plan was stopped by on the Marne and the war turned from mobility to a four years protracted trench warfare. From that moment the western front became a static meat grinder, a giant industrial furnace devouring the youth of millions throughout Europe, from the Alps to the North Sea. Both sides launched massive operations in turn: In 1915 the French in Artois and Champagne, the Germans at Verdun, and the British at the Somme in 1916. On the seas, there was also some form of stalemate as no great naval battle occurred before Jutland in May 1916, the sole occasion for battleships to exchange fire, as previous engagements always opposed faster ships, battle cruisers and cruisers. Royal Irish Rifles ration party at the Somme in July 1916. The looks and faces tells everything. In October 1914, the Ottoman Empire joined the belligerents of the Triple Alliance. In 1915, Italy, which waited and observed events decided to flip sides and entered the side of the Triple Entente (over promises of territorial gains). The Regia Marina found in the Austro-Hungarian navy a worthy opponent. On the Russian front, Hindenburg inflicted serious defeats to the Czar’s Army starting at Tannenberg on 30 August 1914, and its offensive knew no respite, if not Russian winter that froze positions of two camps. The Allies then attempted a diversion in the “soft underbelly” of Europe at the initiative of the 1st Lord of Admiralty Sir Winston Churchill, attempting a landing at Gallipoli in the Dardanelles in 1915. The plan was to swiftly outing the Ottoman Empire from the war, threatening the Austro-Hungarians and Germans from the south. But the landing was a bloody fiasco, Turkish troops prepared by German officers and led by Mustapha Kemal (future “Ataturk” resisting fiercely). In the Atlantic, U-Bootes launched a major offensive to try to severe communications between the old and new world. In 1917, “total war”, unrestricted, resulted in the sinking of the Lusitania, which was instrumental for the Americans to go to war. However it’s only in April 1917, on the cry of “Lafayette here we are” that these troops arrived in Europe relieving the battle-weary Allied, and their presence was found quite helpful after the October Revolution (and Russia’s separate peace), as German troops were rushing from the eastern front. The entry introduction of tanks, better aviation, better coordination, assault troops, new tactics (introduced by the Canadians on the allied side) and most insidious weapons such as mustard gas, still did not resolved the issue. At sea in May 1916 Jutland, did not concretely led to a decisive victory of either side and condemned the Hochseeflotte to inaction until the end in, moored in the Baltic. On the Atlantic, submarine warfare although devastating at the start, run out of breath as the allies multiplied the escorts and refined their ASW tactics, then joined by all the might of the US Navy. On the western front, from May to June 1918, Allies now reinforced in materials and men launched a major offensive (following the defeat of the German spring offensive). Exhausted and demoralized German troops are badly shaken and for the first time the deadlock ends, armies are mobile again. According to the excellent “Conways all the world fighting ships” books, most of the registered navies at the eve of the great war did not had any battleship in service, but cruisers and possibly gunboats which were the most common type of “pocket cruiser” a small Navy can afford. Most cruisers were of British origin and most often from the Vickers-Armstrong giant Industrial Consortium. 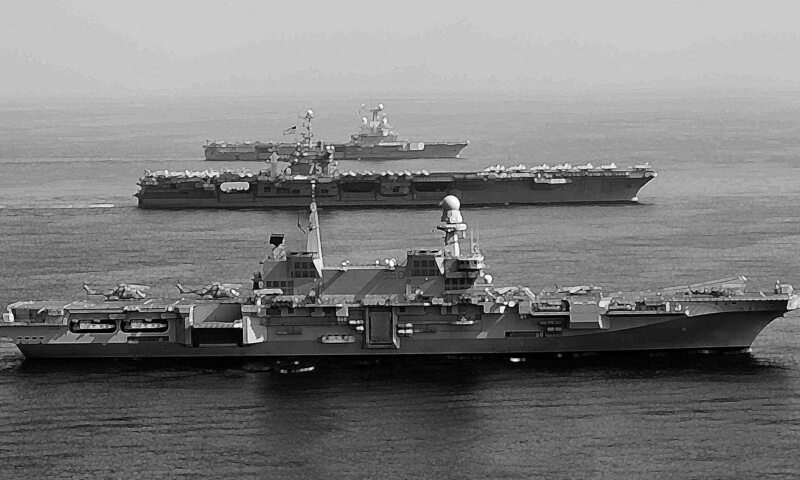 One of these, the unchallenged Royal Nay was a “super-navy”, fit for a great industrial nation, largest colonial empire and global superpower. There was a seemingly endless list of battleships, from the recent, super-fast battle cruisers to the old third-rate pre-dreadnoughts. The Queen Elisabeth class introduced during the war was a brand new league in battleship development, introducing greater speeds and modern engines which got rid of coal. By 1939; although still impressive the Royal Navy had roughly ten times less battleships and cruisers in service, a reminder of how these ranks can fluctuate in a few years. Here are roughly in terms of tonnage the nations and navies of 1914-1918, which will be soon accessible from their flag (work in progress). Various naval oppositions of the great war encompassed the Mediterranean and North Sea, the Baltic, the Pacific, and with the gradual introduction of the submarine, the Atlantic (North and South). At the beginning of the war, the far German Far East squadron would rampaged and scattered its forces over most of the globe. Small naval forces were also present in Africa, like Dar-el-Salaam. The Mediterranean saw no great naval battle as the allied forces had a strong numeric superiority over those of Turkey and Austria-Hungary combined, leading them to inaction. The Adriatic operations only saw minor skirmishes, isolated actions, before the Dardanelles campaign, seeing the allied fleet pitted against forts and mines. The North Sea however saw much more action, from the Dogger Bank, Heligoland, Jutland, the Baltic, blockade and counter-blockade, each side trying to exhaust or paralyze the other. Jutland was in a sense a “missed battle” where the clash of large dreadnoughts was too short and failed occasions because of excessive prudence of the German command, knowing its fleet numerically inferior. The trap consisted to bring the bulk of the British fleet on prepared minefields and waiting U-Bootes failed to materialize, and the German fleet was forced to join an humiliated internment in Scotland, an inglorious end leading to a lot of resentment.